Ever since I watched and reviewed Buck Denver asks...Why do we call it Christmas, the family has become fans of this series. I didn't know what to expect going in, but now, I'm so glad I went after the opportunity to review these videos. In Vol. 10, Jesus is the good news, it focuses on the books of the Bible, Matthew, Mark, Luke, & John. There is so much that happens in these books that is so important. I was interested to see how Jesus' life, death on the cross, and then him rising from the grave would be handed. It can be a tough topic for adults. I was very happy to see how they explained it and the demonstrations used for kids to understand. My littles seems to grasp the idea of what Jesus did better then she ever has since then. It has also led to more questions and discussions, which has been nice to have. The stories presented were very educational and they touched on so many things, and the best part is, they didn't lose the importance behind them. Each segment is fun with the cartoons, puppets, and live action. They mesh well and work in telling these stories at a level that a kid can understand, without dumbing it down. 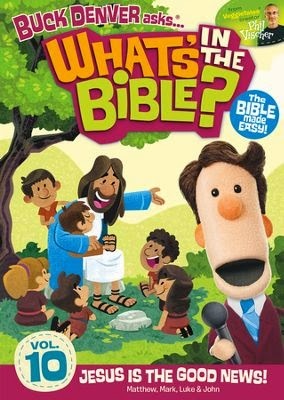 This is definitely a series I would recommended to anyone with kids. Thank you to FlyBy Promotions, I received a copy of this DVD for free in exchange for an honest review.